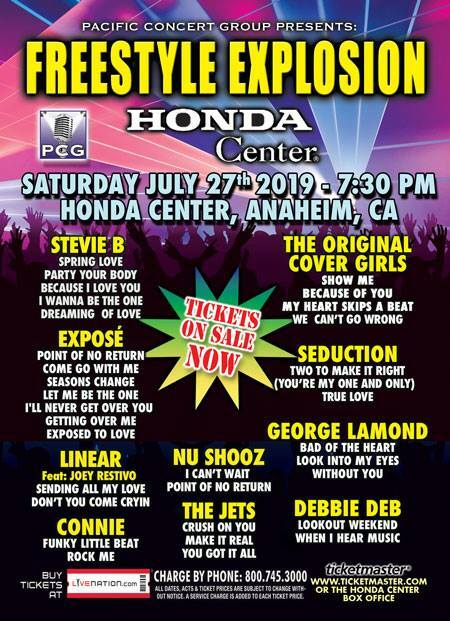 Freestyle Explosion at the Honda Center in Anaheim, July 27th, 2019. 7:30 pm. Let’s bring the house down with the giants of an era never forgotten. Put them Cavaricci’s, slick your hair back and freestyle it like you mean it. Featuring Connie, Stevie B, Exposé, Linear, Nu Shooz, The Jets, The Original Cover Girls, Seduction, George Lamond and Debbie Deb. Tickets on Sale Now at Ticketmaster or the Honda Center Box Office.